I realize that I'm incredibly lucky to live in Alaska where I can pretty much walk out my back door and get fresh wild salmon. However, after eating 15+ pounds of salmon over the course of the winter, it can get a little old, which always leaves me looking for new and exciting ways to make salmon taste good. Salmon cakes are one of my favorite ways to make salmon, mostly because it doesn't involve a lot of planning ahead (and I'm terrible at planning ahead). The recipe calls for canned salmon, but I used a fresh fillet when I made them because that's what I had on hand, #Alaskaproblems. So, if you are lucky enough to have a freezer full of salmon that you are tired of eating, you can use that instead. Just pop a fillet straight from the freezer into the oven at 350°F and cook it until it's flaky (about 40 minutes depending on the size of the fillet). The thing I probably love the most about salmon cakes, is making a delicious sauce to put on top of them. Mostly, I love any excuse to eat mayonnaise, which is what I put on top of them 99% of the time. 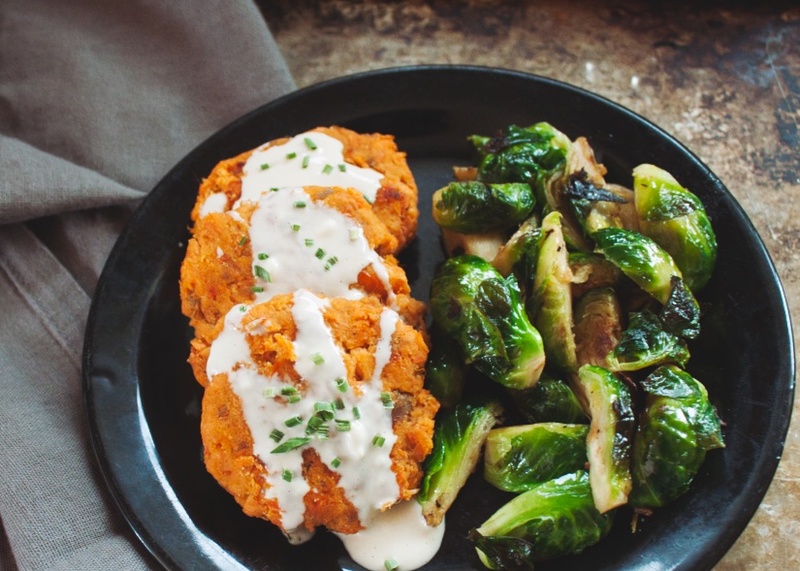 This coconut lime mayo is the perfect compliment to these gingery salmon cakes. They have a little bit of sweetness from the sweet potato and the tangy lime is the perfect balance. I also wanted to make these AIP friendly (I'm dabbling in AIP right now, long story) so they don't have any eggs in them. Usually I'd add an egg to make sure that they stick together. The combination of the coconut flour, coconut oil, and sweet potato not only give them the perfect texture, but they also stick together like champs! Place ingredients in food processor, pulse until combined (you can also mix by hand. Form into patties and place on baking sheet. Cook for 20 minutes until heated through and browned on the outside. While the cakes are cooking, in a small bowl, mix the ingredients for the Coconut Lime Mayo together. If you are using a fresh filet of fish, you can cook it up to a few days ahead of time. I do recommend flaking the fish after it has cooled from cooking because it gets harder to do after you refrigerate it. I cook my sweet potatoes in the Instant Pot. Put the steamer basket inside with 1 cup of water. Add the potatoes (whole, skin on), use the manual function and set it for 10 minutes. Let the pressure release manually for 10 minutes after the timer goes off, then release the remainder of the pressure and open carefully. I like to let the potatoes cool for a few minutes before I peel the skin off. To make the sauce AIP compliant omit the mayo and add a little extra coconut milk. You could also use AIP compliant mayo.